When I have a really great salad dressing on-hand, it's amazing how many vegetables I end up eating in a day. Besides having the dressing on salad, I like to dip crudités in it, stir it into a combination of grains and veggies, and top cooked vegetables. When it's a dressing that requires no machinery to make and is ready in 5 minutes, I am so much more likely to actually make it. That's what I love about this recipe. 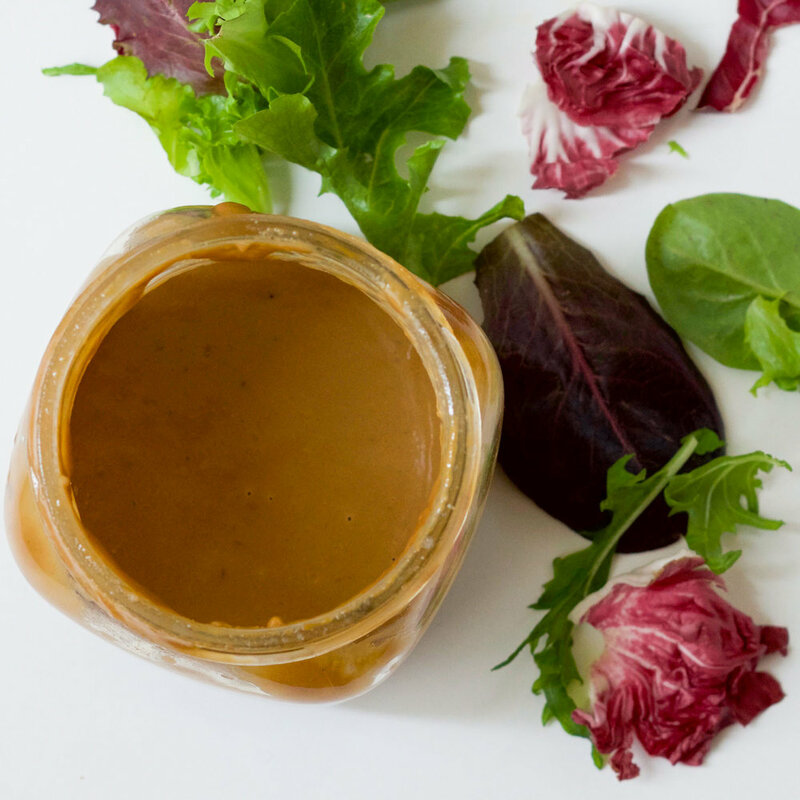 The beauty of this salad dressing recipe is that it requires only three ingredients (plus water and, if desired, salt/pepper): tahini, balsamic vinegar, and maple syrup. That's it. These are ingredients that can simply be stirred in a bowl or jar and you're done. It has enough flavor so that if you prefer a thin dressing, you can simply just add more water to thin it out. In fact, it tends to thicken in the fridge, so each time I take it out I add more water - which stretches the dressing to last an extra serving! The flavor has a pleasant burnt-sugar smokiness to it, thanks to the balsamic vinegar and maple syrup. Only a little maple syrup is required, since the balsamic has a sweetness, too. It would really work any time of year, since the ingredients can be found year round and the complex flavors go well with fall/winter veggies as well as spring/summer. 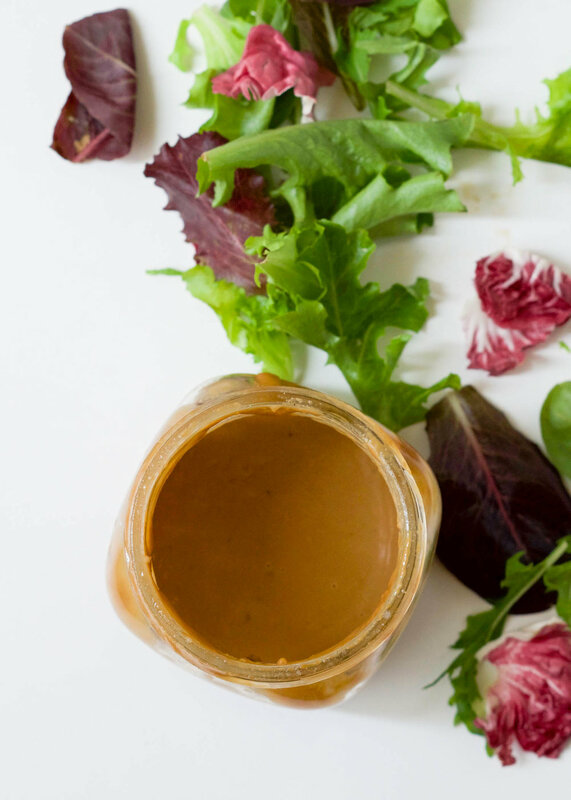 It's creamy, it's rich, it's delish, and I hope you try it on your next salad! 1. MIX: Stir all ingredients together in a small bowl or jar. Add more water by the tablespoon if you'd like a thinner dressing. 2. 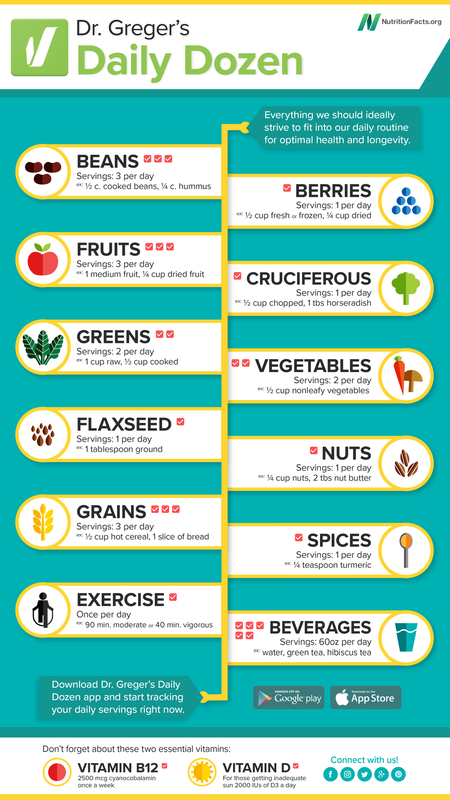 ENJOY dressing salads, sandwich greens, beans, grains. Try dipping or marinading veggies, too! Store the dressing in a sealed jar in the fridge for several days. The dressing tends to thicken in the fridge, so add more water to achieve desired consistency.